Of recent, there has been so much talk about if the President of the Federal Republic of Nigeria, Muhammadu Buhari have a WAEC Certificate. 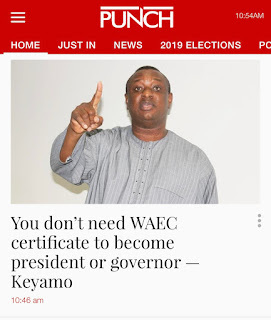 Reno Omokri joined in as he Tweeted asking if he really has a WAEC Certificate. "Dear President @MBuhari, Instead of this rigmarole and deceit, why not just level with us and answer this question truthfully: DO YOU HAVE A WAEC CERTIFICATE? The world wants to know. RETWEET if you want to know the answer to this question. #DOESBUHARIHAVEWAECCERTIFICATE"